Late in the evening on August 10 Hamas and Tel Aviv concluded a 72-hour truce in order to meet at the negotiation table in yet another attempt to stop the bloodbath, which has taken the lives of 1,900 Palestinians and 67 Israelis. However, military activity has resumed today even before the end of the negotiations. RBTH interviews residents of Israel and the Gaza Strip, trying to understand how the war has changed them and how their life appears outside the telecameras. "Here I learned the meaning of the phrase "to be proud of the country you live in", and I will never be able to say the opposite. There is a war going on here, one that worries you, preoccupies you, it makes you cringe, sometimes broadens your chest, it makes you angry, furious, mad, it makes you cry and wait. The war was unequal from the very beginning, but everyday it gives me a reason to be proud," says Yulia Blekhman, graduate of the Moscow State University Department of State Administration, who moved to Israel upon completing her studies in Moscow. She told RBTH how people from all over the country gather provisions and essential items for the soldiers, as well as how they come to the hospitals to visit the wounded. She says that a couple of weeks ago a lone soldier, whose family lives abroad, died in Gaza. The victim's friends wrote on Facebook that his parents would not be able to arrive in time for his funeral and there was the risk that no one would come to part with the soldier. As a result, 30,000 people showed up at the event the following day - people who had never even met him. Marketing Director Sophia Samoilova, who lives in Tel Aviv, says that "society is divided in two: Those who were unsatisfied and wanted to leave even before the war, and are now talking about leaving all the more; and those who love Israel and even postponed their vacations in order to remain in the country during a difficult period." According to Samoilova, Israelis who live in the south have a completely different experience of the war. They have to sleep with their families in bomb shelters, having gathered their family members 15 seconds before an enemy shell explodes above their heads. "Yes, surely the conflict has influenced our daily lives," remarks Samoilova. "But again, in Tel Aviv we feel it less. I remember, though, when the siren sounded for the first time. I was in a shopping center, people were running about panicking everywhere. The Internet and the phones stopped working. Later everyone got used to it. But during the weekend the city, where life was always in full swing, is empty." "Almost 60 percent of the Gaza Strip is made up of children and adolescents," says Lyudmila Al Farra, a doctor at one of the hospitals in the Gaza Strip. "Therefore, first and foremost the war concerns them, not us. There are many wounded among them. Parents cannot let their little darlings out onto the street because there are always Israeli reconnaissance planes flying over their heads." She notes that 250,000 people were forced to leave their homes, their abodes being partially or totally destroyed. In her words, the villages bordering Israel have almost entirely been wiped out and people are moving to the country's central regions, trying to save their lives. "During the first phase of Israel's military operations you could hear the explosions and the F-16 destroyers hitting ground targets miles away," continues Al Farra. "It felt like an earthquake, as if our house was about to collapse. During the ground operations, shrapnel from the artillery shells came flying to our house. We were even forced to leave the house for three days." She says that people do not have housing, food, potable water and clothes. "We will continue working and we will remain here. I am a doctor, I can’t just leave. Especially since peace seems to be on the horizon. We'll see what happens." 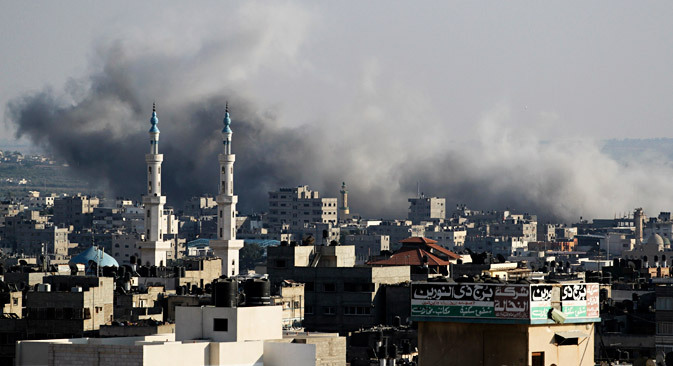 Israel demands the cessation of missile launching from the Gaza Strip and its full demilitarization. In turn, Hamas demands that Tel Aviv lift the blockade of Gaza, open all the border checkpoints, that citizens be allowed to move freely and that a transportation corridor be created between Gaza and the West Bank (Judea and Samaria). The demands also include the elimination of the security corridor that Israel established after Operation Enduring Force, the restoration of Gaza, as well as the recognition of the Palestinian National Authority government within Fatah and Hamas.